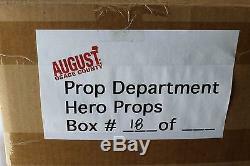 For your consideration is this unique Set of Movie Props from "August: Osage County" starring Meryl Streep, Julia Roberts, Ewan McGregor, Chris Cooper, Abigail Breslin, Benedict Cumberbatch, Juliette Lewis, Margo Martindale, Dermot Mulroney, Julianne Nicholson, Sam Shepard, and Misty Upham. The film was released in 2013. Julia Roberts was nominated for an academy award for best actress in a supporting role for her portrayal of the character Barbara Weston in this movie. Meryl Streep was nominated for an academy award for best actress in a leading role for her portrayal of Violet Weston in this movie. 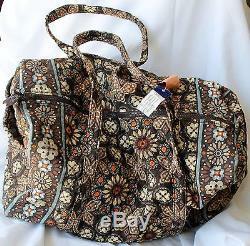 Vera Bradley Quilted duffel bag (Retired pattern "Canyon" August 2012- August 2013). Black Cordless "AT&T" telephone and base unit. 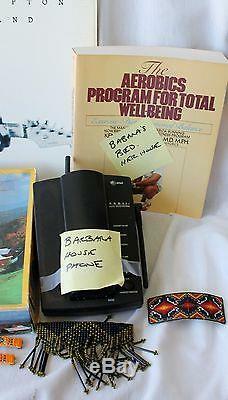 Large paperback book "The Aerobics Program for Total Well Being". 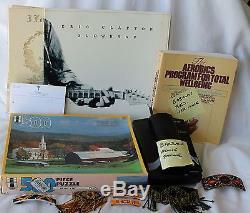 1977 Eric Clapton Vinyl LP Album "Slowhand". 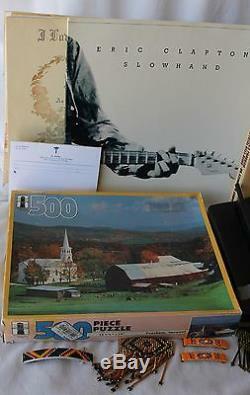 500 piece puzzle of Peachham, Vermont. Prop Prescription Pad for Dr. Several pages of sheet music. Six seed bead hair barrettes with Native American designs. The quilted bag can be seen in one of the trailers for the film, being carried by Julia Roberts when she arrives at her parents house. The bag was handed to her by Ewan McGregor. The strap of the bag can be seen on her shoulder in the film. The bag also includes faux luggage tags for "Barbara Fordham" (Barbara Weston's married name). The black cordless telephone can be seen in the film, when Barbara (Julia Roberts) answers the call from her sister with news about her father. The paperback aerobics book can't be seen on screen but was used during production of the film as a prop on Barbara's (Julia Roberts) bedside table. The Eric Clapton album "Slowhand" was used during the production of the film and includes the song "Lay Down Sally", which is played several times during the film by Violet Weston (Meryl Streep). The 500 piece Vermont puzzle can be seen on screen in more than one scene, Violet Weston (Meryl Streep) is putting it together at the dining table while talking to her daughters in the "eat the fish" scene. The box of the puzzle can be seen to the side of the dining table on a small side table/tv tray. Burke prescription pad was using during the production of the film, Dr. Burke was Violet Weston's (Meryl Streep) doctor. The several pages of sheet music can be seen throughout the film sitting on the piano. They are also visible on screen during the scene when Little Charles (Benedict Cumberbatch) and Ivy Weston (Julianne Nicholson) are sitting at the piano and he is playing a song for her. The six beaded barrettes were used during production of the film, for Johnna Monevata (Misty Upham), the Native American housekeeper. These items were acquired from a reputable prop house near Los Angeles, CA. Movie props and come with a Certificate of Authenticity. Please feel free to ask any questions. 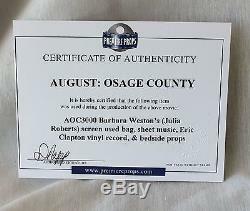 The item "August Osage County Julia Roberts Meryl Streep Screen Used Movie Set Prop Lot" is in sale since Thursday, June 5, 2014. This item is in the category "Entertainment Memorabilia\Movie Memorabilia\Props\Originals". The seller is "meeko33382pg" and is located in Brentwood, California. This item can be shipped worldwide.